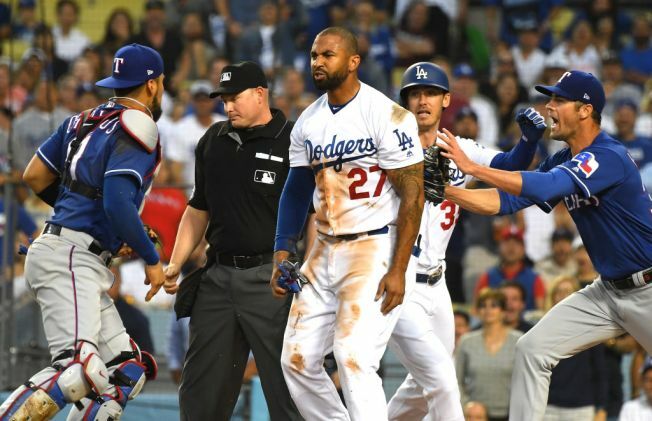 Tensions got heated at Dodger Stadium after Los Angeles Dodgers outfielder Matt Kemp barreled into Texas Rangers catcher Robinson Chirinos in the third inning. Watch what happened after. Tensions got heated at Dodger Stadium between the Los Angeles Dodgers and Texas Rangers on Wednesday night. Dodgers' outfielder Matt Kemp barreled into Rangers' catcher Robinson Chirinos during a play at the plate in the bottom of the third inning. Kemp was attempting to score from second base on a single to right field by Enrique Hernandez. However, the throw from right fielder Nomar Mazara beat Kemp to the plate, but Chirinos was blocking his path. Kemp hesitated for a second appearing on the verge of giving himself up on the play before lowering his shoulder into Chirinos. Chirinos held on to the ball, and Kemp was ruled out on the play, but the catcher didn't take too kindly to the collision and pushed Kemp. Kemp pushed Chirinos back and both benches cleared. Both Kemp and Chirinos were ejected from the game for the altercation. Videos of the incident are below.